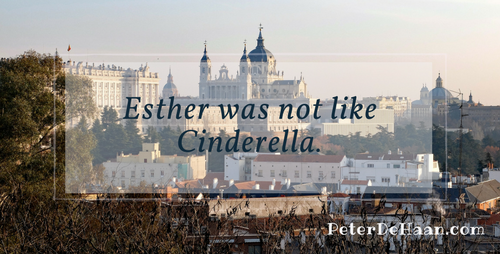 I’ve always liked the story of Esther. She was a peasant girl who won a national beauty pageant and became queen. In my imagination, I’ve given this tale a Cinderella-like grandness, with Esther and the king, falling in love and living happily ever after. Esther and her people were forcibly relocated to a foreign land. She was a spoil of war. Esther did not opt to take part in the beauty contest. All attractive virgins were compelled to participate. Esther’s heritage prohibited her from marrying outside her faith. To do so would be a shameful and disobedient act. Even after she became queen, he continued to enjoy the company of other women in his harem. She and the king didn’t have regular interaction. He had not “summoned” her for thirty days. “I loathe the bed of the uncircumcised,” that would be the king. “I am under constraint” to wear the crown, that is, to be queen. Sadly, there is no love, happiness, or satisfaction in her role as queen. Even so she did use her unwanted position to save her people, the Jews, from a certain annihilation. So this account of Esther isn’t a love story, at least not in the traditional sense. It is, however, a tale of valor and bravery—and a reminder that one person can make a difference.